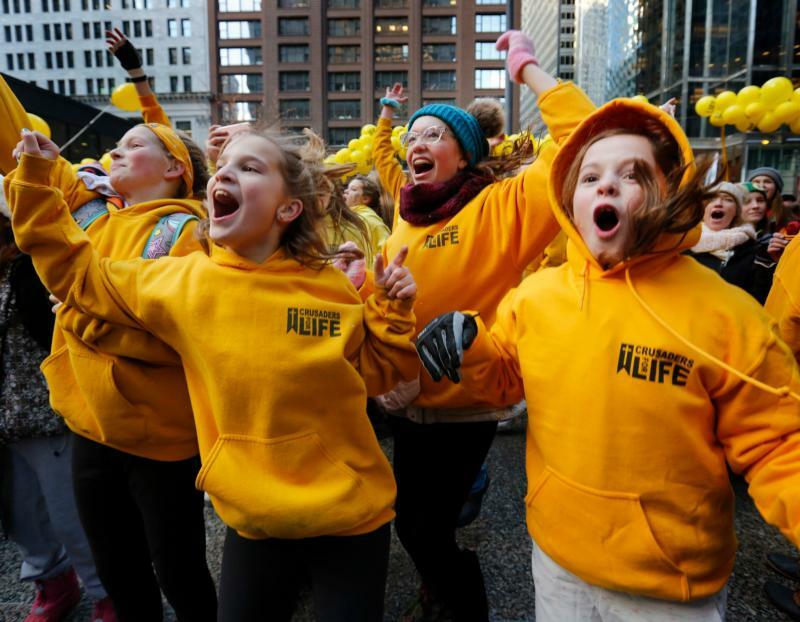 CHICAGO (CNS) — Marian Catholic student Chantelle Belcher attended the March for Life Chicago Jan. 13 to support women who may be considering aborting their child. Belcher was one of several thousand people from Illinois, Indiana, Michigan, Wisconsin, Iowa and Missouri who turned out for the annual march in downtown Chicago that began following a rally in Federal Plaza and proceeded around downtown. It is held annually before the national March for Life in Washington, which this year is Jan. 18. The national March for Life has been held annually since 1974 near the Jan. 22 anniversary of the U.S. Supreme Court’s Roe v. Wade decision that legalized abortions in 1973. Marian student Serena Johnson also attended the march with the group from the school. “I wanted to come to support everyone and to support the fact that life isn’t one of those things you can debate about. It’s one of those things where there’s one answer and it’s pro-life,” Johnson said. Alex Jones, who runs the youth group at St. Anne Parish in Kenosha, Wisconsin, said his parish brought two buses of parishioners, young and old, to the march. Jones and his wife are expecting their first child and he said that has given him a new perspective on this issue, especially as it relates to sharing that message with youth. Before the marchers processed through the streets carrying signs and chanting pro-life messages, they heard from several speakers at a rally, including Chicago Cardinal Blase J. Cupich; Chicago Bears vice president Pat McCaskey; Jeanne Mancini, president of the national March for Life in Washington; and a mother who changed her mind about aborting her daughter through the help of Aid for Women, a local pro-life women’s organization. In his remarks, Cardinal Cupich stressed the uniqueness of every human life. Cardinal Cupich also had a message for the many young people at the rally. “You, young people, give us hope and encourage us as we know that year after year as we march into the future, there will be others who will continue this effort to protect human life and dignity, who will take up the work of providing life-giving alternatives to pregnant women, enabling them to build stable lives amidst sometimes difficult circumstances who will not be daunted by the challenges, who will look for ways to walk with the poor, the sick, the defenseless, the vulnerable, the sinful and make sure that no one is excluded from the table of the human family,” he said. He counts on the young people to promote the dignity and uniqueness of every human life. “As you gather with friends and appreciate the gift of each person, as you study in your science classes about the unique DNA characteristics of each human being, as you think about your own life and reflect on the plan God has for you, be willing to witness to all that you believe and know from your experience,” he said. Many of the Catholics at the march attended in the standing-room-only Mass for Life with Cardinal Cupich at Holy Name Cathedral that morning. Before the Mass, nearly 500 young people attended a youth rally at Frances Xavier Ward School, located next to the cathedral.